But I’m going to be honest with you, I had enough time to listen to the whole Flood album while I was making this recipe. It takes about an hour and 15 minutes to make. The recipe is based on a baba ghanoush that I found on the Cook’s Illustrated site. Their method is to slow roast the eggplant in a very hot oven for 1 hour. I decided to roast a yellow bell pepper and a head of garlic to go along with it. It’s a lot of garlic, but roasting mellows it out quite a bit. This baba ghanoush and pita chip combo clocks in at only 132 calories and 7g net carbs per serving. So go ahead and dig in. Just remember, “If you’ve a date in Constantinople, she’ll be waiting in Instanbul”. This low carb baba ghanoush with pita chips recipe uses Joseph’s Lavash Bread for the pita chips. It’s a great Middle Eastern appetizer with only 2g net carbs. 2. Brush melted butter on both sides of a slice of Lavash Bread. Cut into quarters and then split each quarter into 3 pieces. Separate slightly to make sure they are cut through. Repeat with second slice of Lavash. 3. Bake for 4-5 minutes until browned. Keep a close eye on them because they burn quickly. 4. Increase the oven temperature to 500 degrees F and cover a cookie sheet with tin foil. 5. Place whole eggplants and bell pepper onto cookie sheet. Cut the ends of a head of garlic on the side opposite to the stem. Wrap garlic in tin foil and add to the cookie sheet. 6. Bake for 15 minutes and then turn the eggplant and bell pepper over. It should be charred on one side. 7. Bake for another 15 minutes, and turn the eggplant and bell pepper again. Remove the garlic from the oven and unwrap to cool. 8. Bake for 15 minutes and turn eggplant for the final time. Remove the charred bell pepper now. Bake eggplant for 15 minutes. 9. Allow the eggplant, garlic and bell pepper to cool enough to handle. Remove the skin from the bell pepper and dice. 10. Squeeze the garlic out of the casings. Cut off the ends of the eggplant and cut in half. Use a large spoon to scrape out the insides of the eggplant and add to a colander. Drain for 3 minutes. 11. Add garlic, eggplant, tahini, lemon juice, olive oil, salt and pepper to a food processor or high powered blender and pulse a few times until roughly blended. 12. Mix in chopped bell pepper and sprinkle fresh parsley on top. Refrigerate for 30- 45 minutes until chilled. Serve with pita chips on the side. If you liked this recipe, then you might like my recipes for Cauliflower Hummus, Hemp Seed Tabouleh or Cauliflower Tabouleh. The baba ghanoush is Keto, but the pita chips are not. 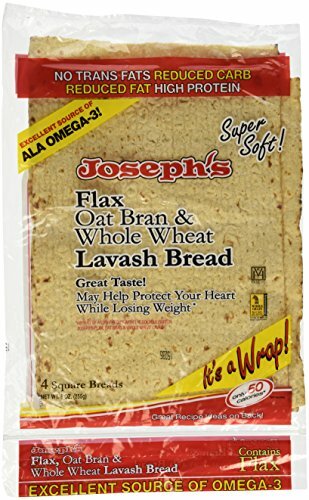 Joseph’s Lavash bread has grains in it, unfortunately.